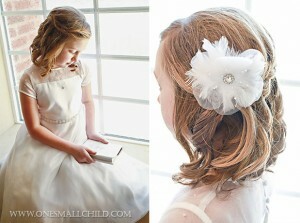 We introduced our First Communion dress line for 2014 last week; today is all about Communion accessories for girls! We’ve pulled together a lovely collection of veils, headpieces, shoes, hosiery and more for all your First Communion needs. Each item is pretty on its own, but put it together with your special dress and you’ve got a look that is truly beautiful. Whether your girl prefers simplicity or all-the-frills, we’ve got everything you need in one convenient location.